Department of orthodontic deals with correction of teeth & jaws that are positioned improperly. The treatment is done to those patients suffering from overbite (buck teeth), under bite, cross bite, open bite, misplaced mid line, spacing, crowding. Benefits of orthodontic treatment include healthier mouth, a more pleasing appearance and teeth that are more likely to last a life time. We do the treatment by the help of fixed appliances (Braces, special fixed appliances, fixed space maintainers) & removable appliance (Aligners, removable space maintainers, jaw repositioning appliances, lip & cheek bumpers, palatal expander, removable retainers, Headgear). Department provide clinical care & the educational opportunities for current & potential students. Department has two functioning units. State of art post graduate orthodontic clinic & undergraduate clinic. department provides specialist (post graduates) in three years after BDS degree approved by DCI India. VIbrant & dynamic 8 postgraduate residents who provide contemporary treatment for up to 500 to 800 patients per year. Mission – Patient centered education committed to excellence. 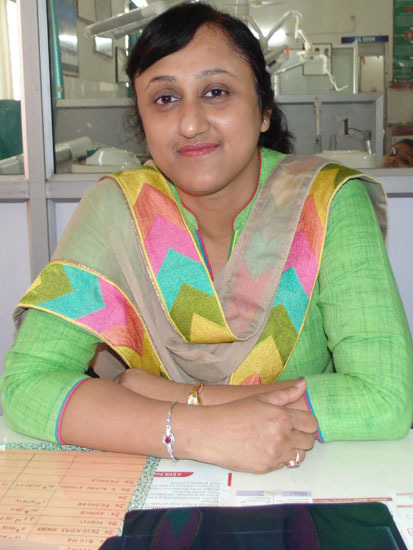 The department is headed by Prof Namrata Rastogi. She did her graduation and post graduation from prestigious King George’s Medical College Lucknow UP. She has having experience of over 12 years. She has published more than 10 articles in national & international journals. She has participated in various national & international conferences.